I have really been testing my food chemistry skills this week. I took two of my favorite recipes, fruit crisp and banana bread and came up with healthier alternatives that are wheat and dairy free. The results have been great and I am so excited to share them with you! I hope you love this Peach Almond Crisp as much as we do. This dessert is very simple to throw together. I replaced the butter with organic unrefined coconut oil. It gives baked goods a wonderful flavor, without having an overpowering coconut taste. It’s very subtle and makes recipes very moist. I also replaced the regular flour with oat flour for a whole grain substitution. Fresh or canned peaches and slivered almonds seasoned with cinnamon and brown sugar, covered in a crumbly oat topping and baked. The perfect summer dessert! Wheat free, dairy free and vegan. Even better served warm, topped with a scoop of vanilla ice cream. 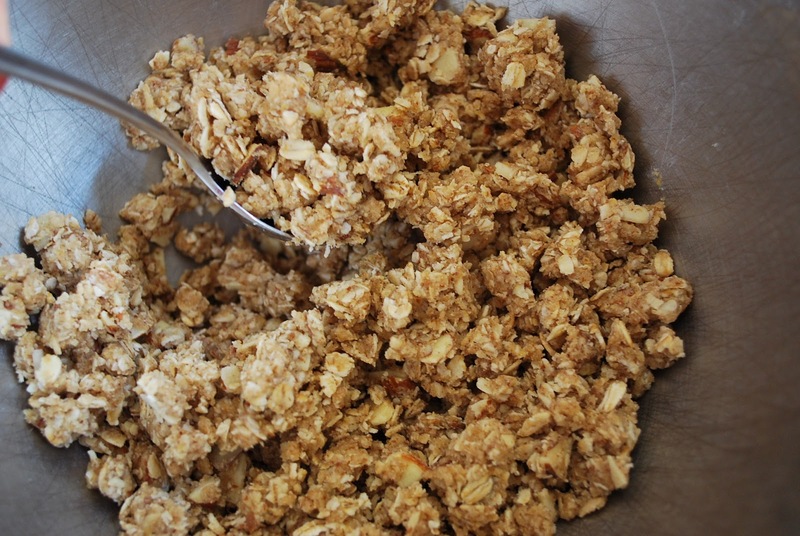 In the bowl of an electric mixer, add all topping ingredients and mix on medium speed until it forms a crumbly texture. Set topping aside and prepare your peaches. Place drained peaches into a 7 x 11″ glass baking dish sprayed with cooking spray (if you are using fresh ripe peaches, add a little stevia or brown sugar for sweetness). Sprinkle with lemon juice, stir and then generously sprinkle cinnamon on top. Add your topping over the peaches in an even layer and bake at 350 degrees for 45 minutes. Preheat your oven to 350 degrees. In the bowl of an electric mixer, add all topping ingredients and mix on medium speed until it forms a crumbly texture. Set topping aside and prepare your peaches. Place your drained peaches into a 7 x 11″ glass baking dish sprayed with cooking spray (if you are using fresh ripe peaches, add a little stevia or brown sugar for sweetness). Sprinkle with lemon juice, stir and then generously sprinkle cinnamon on top. Add your topping over the peaches in an even layer and bake at 350 degrees for 45 minutes. This Peach Almond Crisp is amazing with a heaping scoop of ice cream! Healthy and looks absolutely delicious… love that picture with the peaches peeking out… Yum! I love fruit crisp. This one looks and sounds good!